Berlin (Germany) – March 8, 2018 (travelindex.com) – 2017 has been an exceptionally strong year for international travel, with Europe being the main growth driver as both a source market as well as a destination region. Worldwide, the number of outbound trips has increased by 6.5 per cent, reaching nearly 1.2 billion international trips in 2017. Also positively, for the first time since IPK surveys the impact of terrorism on international travel, terror sensitivity has decreased and destinations are perceived as “safer” than before. These findings are based on latest results of IPK’s World Travel Monitor®, an annual survey analyzing the outbound travel behavior in more than 60 countries worldwide, covering over 90 per cent of the global outbound demand. Trends for the first eight months of 2017 can be found in the ITB World Travel Trends Report, which is published yearly by ITB Berlin. In 2017, Europe was the strongest source region for international travel with an overall increase of 7 per cent compared to last year, followed by North and Latin America with both 6 per cent and Asia with 5 per cent. Also as a destination region, Europe could profit most with 8 per cent more trips in 2017. Looking at destinations on a country level, Spain takes the lead, with the USA and Germany ranking second and third. France and Italy are the fourth and fifth most successful destinations. When it comes to holiday types, city trips have been the main growth driver last year with an increase of 18 per cent. Sun & beach holidays, which represent the largest holiday market share, grew by 9 per cent. On the other hand, tour holidays worldwide decreased by 1 per cent. Overtourism has made headlines worldwide recently due to record visitor numbers at many destinations, prompting well-publicized protests by residents and diverse measures by local authorities. As this topic not only impacts destinations, tourist attractions, local infrastructure and residents, but also travelers themselves, IPK International conducted a special survey among international travelers in February 2018. The results show that 24 per cent of all international tourists had the feeling that the destination they visited was overcrowded. However, only 9 per cent said that this overcrowding actually affected the quality of their outbound trip. Most affected cities were Mexico City (23 per cent), Shanghai (22 per cent), Venice (20 per cent), Beijing (19 per cent), Hong Kong (18 per cent), Istanbul, Amsterdam and Florence (17 per cent each) and Barcelona (16 per cent). For the fifth time, IPK International conducted a special survey on the influence of terror threats on international travel behavior in main source markets worldwide in February 2018. The study revealed that for 37 per cent of international travelers the recent instability and terror warnings will have an influence on their travel plans for 2018, compared to 41 per cent in October 2017. Regarding the question what kind of influence the current situation could have on the travel behavior, 24 per cent stated that they will still be travelling abroad, however only to destinations they percei¬ve as “safe”. For some destinations, the safety image has improved and they are rated slightly more safe compared to October 2017. This applies e.g. to some of the biggest destinations such as Spain, USA, Germany and Great Britain. 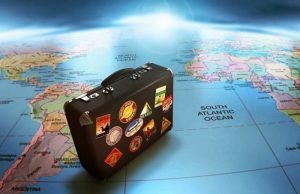 Although different travel risks do exist, IPK International anticipates global outbound trips to in¬crease by a robust 5 per cent in 2018. According to IPK International’s Outbound Travel Forecast for 2018, Latin America is expected to be one of the high performers with an increase of 7 per cent, closely followed by Asia (+6 per cent). International travel from Europe as well as North America is forecasted to grow by 4 per cent each. ITB Berlin 2018 will be taking place from Wednesday, 7 to Sunday, 11 March, and from Wednesday to Friday will be open to trade visitors only. ITB Berlin is the World’s Leading Travel Trade Show. In 2017 a total of 10,000 companies and organizations from 184 countries exhibited their products and services to around 169,000 visitors, who included 109,000 trade visitors. Parallel with the show the ITB Berlin Convention, the largest event of its kind, will be held from Wednesday, 7 to Saturday, 10 March. Admission to the ITB Berlin Convention is free for trade visitors and exhibitors.